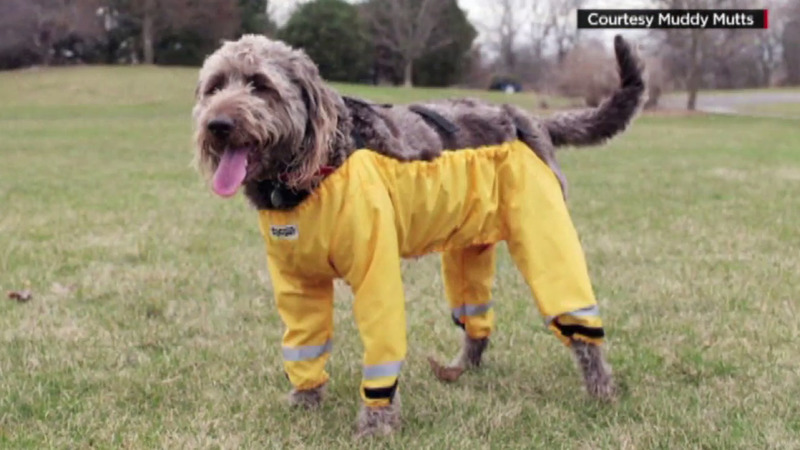 LOS ANGELES (KABC) -- A Canadian dog wear maker is trying to convince people that man's best friend should wear pants. A 19-year-old student in Belgium said his girlfriend's dog Rocky got him thinking how dogs would look in pants. He posed the question online and people went nuts joking and debating the question of not just should dogs wear pants, but how they would appear in them. So should dogs wear pants on just their hind legs or on all four legs? Tim Skelly, owner of Muddy Mutts, tried to settle the debate by saying a pup should wear pants on all four legs. He and his wife sell waterproof nylon waders that go for $50 in the U.S. He said the pants for dogs are a good idea. "It looks really funny, but when you get tired of cleaning a dog for 20 minutes after a walk, it's really practical," he said. It was a niche product until a diagram of dogs in four- and two-legged pants went viral online - that's when sales jumped 2,800 percent, Skelly said. Now there's a waiting list, and Skelly races to make more Muddy Mutts. He said the easiest way to put the pants on your furry friend is to start with the front legs. Each leg goes through the opening and is fastened with Velcro cuffs. Thanks to Skelly's Muddy Mutts, even Rocky - the dog who inspired the debate - may soon be in a pair of his own.